Just up the road from my friend's home is a field with two horses in it. From a distance, each looks like every other horse. But if a person stops and watches the horses, he or she will notice something quite amazing. One horse is blind. His human caregiver has chosen not to have him put down, but has made a good home for him. Listening, one will hear the sound of a bell that comes from the smaller horse in the field. A small bell is attached to her bridle. It lets her blind friend know where she is, so he can follow her. Upon observation, one sees how she is always checking on him, and that he will listen for her bell and then slowly walk to where she is, trusting that she will not lead him astray. 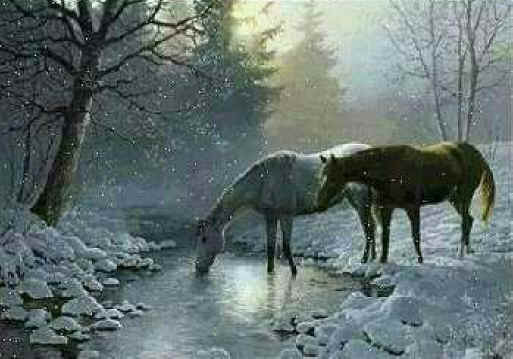 Like the human caregivers of these two horses, God does not throw us away just because we are not perfect or because we have problems or challenges. He watches over us and even brings others into our lives to help us when we are in need. Sometimes we are the blind horse being guided by God and those whom he places in our lives. At other times, we are the guide horse, helping others see God.